National Oceanic and Atmospheric Administration | Strike of Lightning! WASHINGTON, January 23 .- The sun is bombarding the Earth with radiation from the largest solar flare in more than six years and anticipates that it will continue until mid-week. 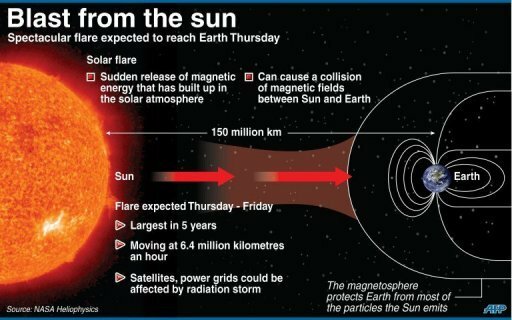 The solar flare occurred at about 0400 GMT on Monday and the radiation is affecting our planet with three different effects at three different times, said Prediction Center Space Weather National Oceanic and Atmospheric Administration (NOAA). Radiation affects all satellites and astronauts in space. Communication can cause problems to aircraft in flight recorders, a physicist at the Center said Doug Biesecker. Radiation Sunday’s storm arrived at Earth an hour later and will probably continue until Wednesday. The levels are considered severe, but there have been other storms stronger. It is the most intense radiation from about May 2005. The radiation-in the form of protons, arrives from the sun 150 million kilometers (93 million miles) per hour. “The entire volume of space between here and Jupiter is filled with protons and one of them is not released just like that,” said Biesecker. That is why the effects will last a couple of days. Surgeons solar space and NASA experts studied the possible effects and determined that the six astronauts in the International Space Station in orbit need not do anything to protect against radiation, said spokesman Rob Navias. The solar flare is followed by three movements, said Antti Pulkkinen, a physicist at NASA in Maryland and Catholic University. First there is electromagnetic radiation. After the protons are emitted. Finally it is clear the plasma of the solar surface, which usually travels at 1.6 to 3.2 million kilometers (1 to 2 million miles) per hour, but this storm is particularly fast and fires 6.4 million km (4 million miles) per hour, said Biesecker. Is the plasma that causes many of the problems on Earth, such as power failure. A 1989 solar storm caused a massive blackout in Quebec. This detachment is likely to be moderate, although the possibility of intensified, he said!